days since my last post about why it is possible for so few people to feed the rest of us. Historian Rachel Laudan raised key questions on her blog about why farming is still mostly a family endeavor and why that matters to us. Jayson Lusk (an ag economist) responded with a good point that although corporate farms represent a small number of entities, they are disproportionately significant in terms of production. We might also consider the fact that a great many farms tracked by the USDA are very small, part time operations that contribute very little to overall production. I think one of the things that complicates the whole discussion around food and farming, is that when we use the word "farm" as a noun, we could be talking about such a huge range of entities. Below I'll try to capture at least one measure of that diversity. 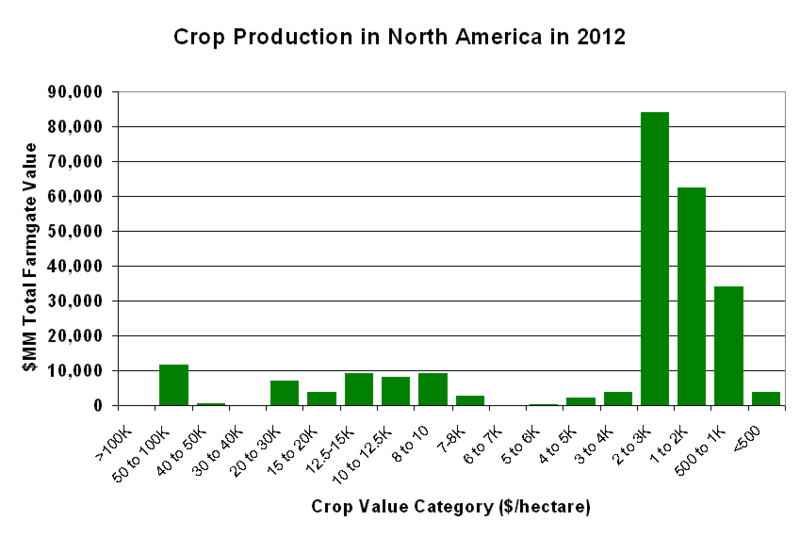 The graph above is about the range of per-area value of crops in North America (using data from FAOStats). You can see the vast area of relatively low farm-gate value row crops (corn, soy, canola,wheat...) in the $500-3000/hectare range ($200-$1,200/acre). Then there is another set of crops in the $7-$30,000/hectare range that includes various "specialty crops" like fruits and vegetables. This does not even capture big differences within a given crop (e.g. irrigated and non-irrigated row crops, berries for fresh market vs freezing...). 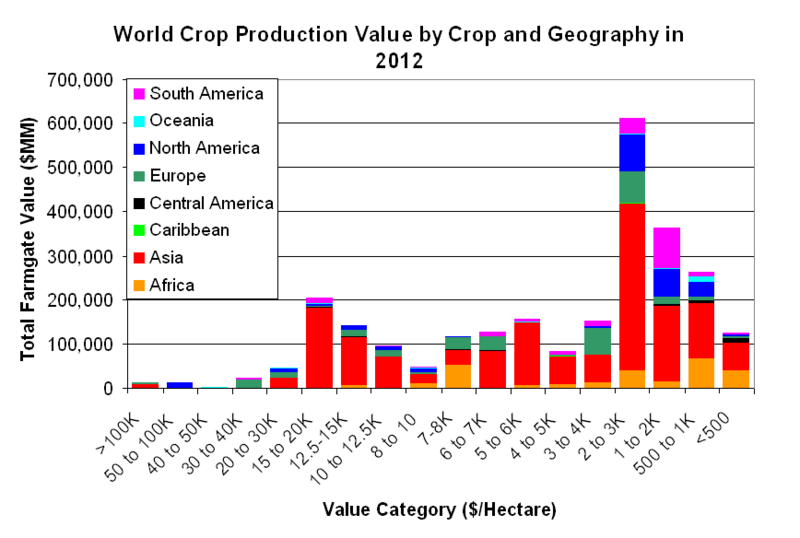 There are obviously major differences between the sorts of farms represented here beyond just the value of the crop. The diversity gets even crazier when we look at agriculture globally where the value is spread over what looks like a tri-modal distribution with a 100+-fold difference in per area value. I'm not sure these stats even capture the super high value/area protected culture industry (shade houses to greenhouses) which is a rapidly growing segment around the world. To make the discussion even more complicated, these graphs do not even touch on animal agriculture which is not only diverse in terms of species, but also scale. It includes everything from very small-scale cow/calf operations to large-scale feedlots or laying houses and everything in between. This brings me back (finally) to my title: "Farm ain't a thing, farm is a verb." When we use farm as a noun we we might be talking about entities which are not even very similar. But I believe that there is an essential commonality about farming when we think of it as a verb. As incredibly diverse as as farming may be in terms of value or even of the details of what the work involves, there is a certain universal thread. It is essentially about harnessing the amazing potential of biology to produce things we really need and/or want. For most of the people doing that, it is in the context of an environment that can only partially be controlled (as opposed to someone harnessing biology to use biology to produce something in a fermentation vat, and even that is tricky). Perhaps that is why there is some sort of commonality between the "farmers" who actualize the verb in so many different ways. In my long career, I have had the chance to meet a very diverse set of people who farm. 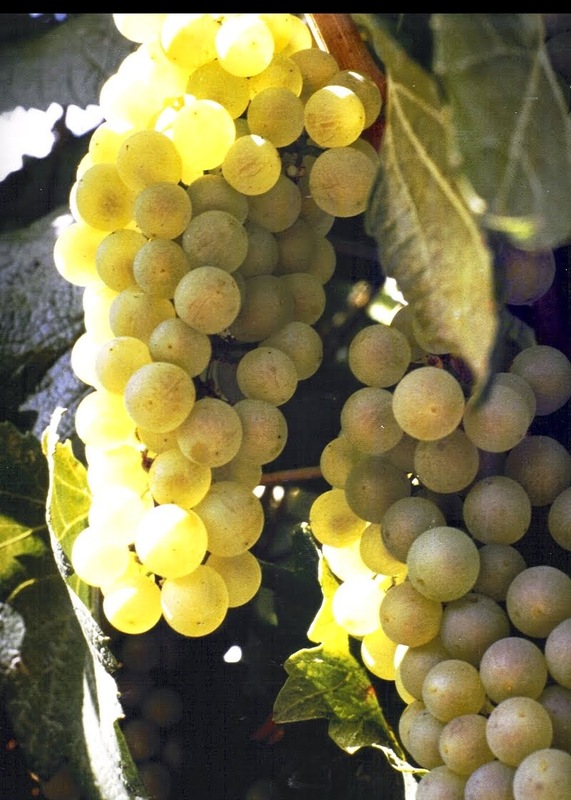 My introduction to agriculture was via the super high-value wine grape industry in California. These growers run some intensive operations. On the other extreme, I've spent quite a bit of time talking with dry-land wheat farmers in Western North Dakota who must use a super low-input approach (I asked one such farmer cooperator to apply our experimental biocontrol agent for Canada Thistle with a 40 gallon/are spray. He said, calmly: "Son, out here we call that an irrigation.") Lately, on the speaking circuit, I've had some exposure to dairy and fish farming which is mostly new to me. My experience is still only with a small slice of what it means to farm, but I can honestly say that whether I am talking with one of those wheat farmers, or with a manager for a 60,000 acre almond operation, it feels like they have the same basic orientation. They are all people who need to understand the dynamics of their particular biological system and what options they have to try to achieve their goals. That is true for both organic and conventional farmers, or the common case of farmers who do both. So I guess the point of this post is not to discourage discussions of farming because they can so easily get confused by the diversity. I really do believe that there is a common thread in the verb form of "farm" and we food consumers who don't do the verb might do well to listen to the incredibly diverse set of actors that do. Graphs are mine based on FAOStat data. Many consumers today feel out of touch with how their food is produced and are disturbed by a lot of what they hear about it through their social networks or other sources of information. 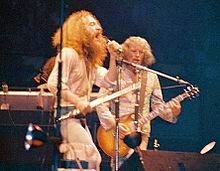 If it is necessary to assign fault for this phenomenon, I think we could blame Jethro Tull. 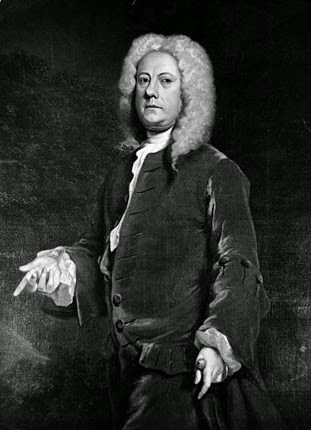 No, I don’t mean the 70s rock band led by flautist Ian Anderson and guitarist Martin Barre, I mean the early 18th century agronomist and inventor named Jethro Tull (the two Jethros did; however, have similar hair styles). 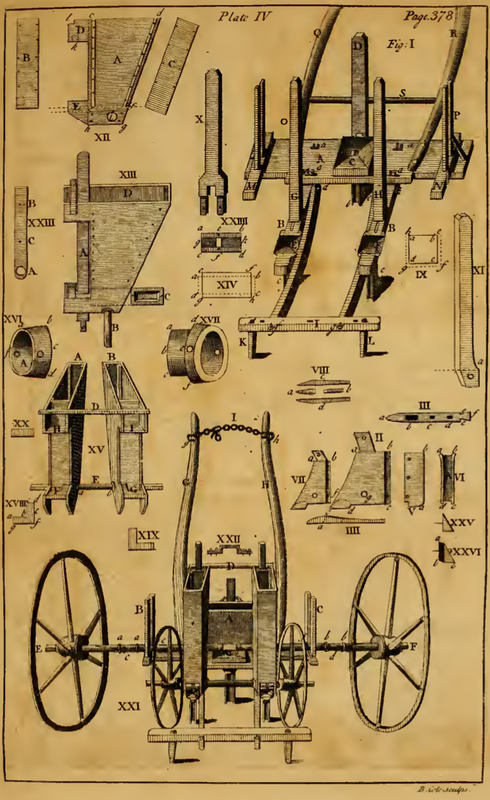 In the early 1700s, Tull introduced planting equipment that allowed farmers to grow their crops in rows and cultivating equipment for hoeing the weeds that grew between them. This innovation dramatically increased the amount of land that one farmer could tend. For thousands of years the production of food was the full time occupation of all but a small, elite proportion of the population. Starting with Tull’s innovations, Western civilization was on a track towards an agriculture system that required less and less hand labor. Since then there has been a steady stream of innovation that has further enhanced the productivity and efficiency of farmers thus freeing up the rest of the population to do other things. 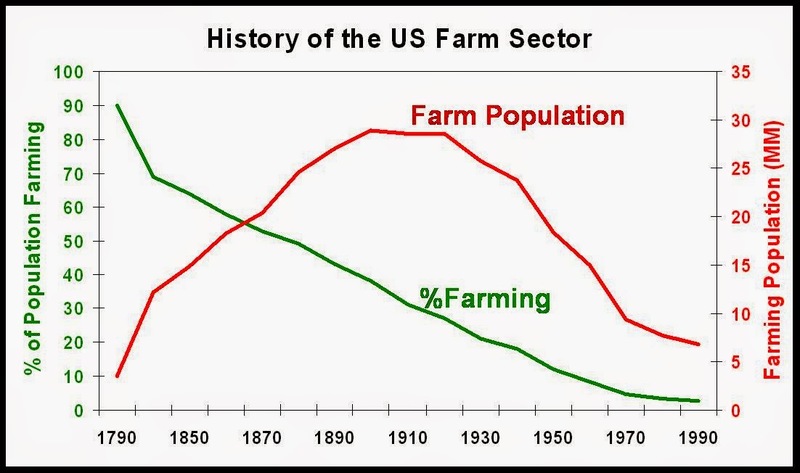 In the graph below, you can see that between 1790 and 1890, the number of farmers in the US rose from less than 5 million to 30 million (red line). It was during that time that the vast prairies of the Midwest were converted to farming with the support of the Federal government via the Homestead Act. Interestingly, even during that period of rapid farmland expansion, the percent of the total US population doing the farming steadily declined (green line). When the US became an independent nation at the end of the 18th century, 9 out of 10 Americans farmed. Today that number is less than two in one hundred. Mechanization made this possible. 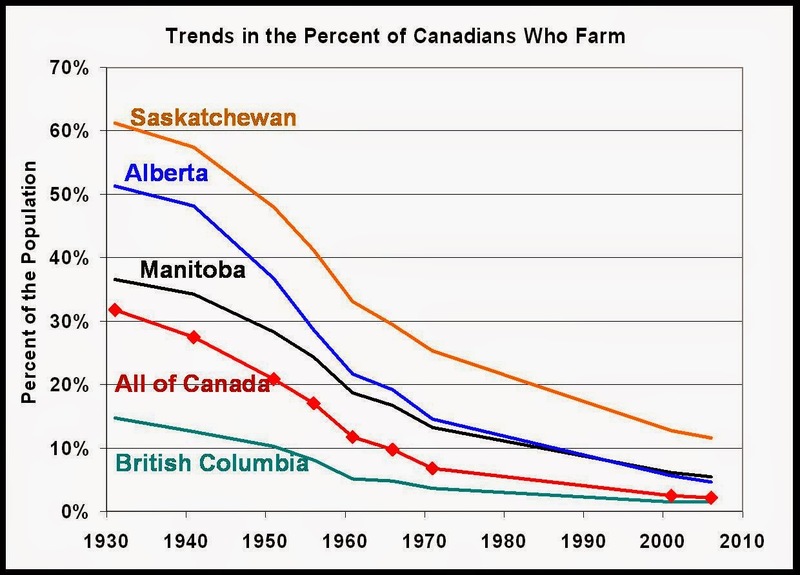 A similar trajectory can be seen for our neighbors to the north, even in its most agrarian provinces. Throughout that history, Americans and Canadians have remained well fed as a whole with any incidents of hunger stemming from issues of wealth distribution rather than a problem of overall supply. 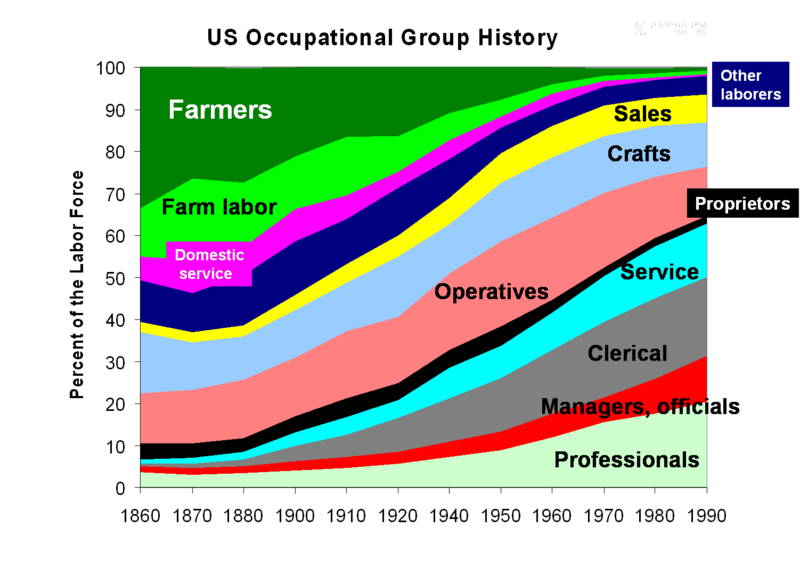 In fact the tiny proportion of North Americans who farm also help to feed other populations around the world..
Campbell Gibson, who has retired from the US Census bureau, has published fascinating statistics about historic trends in the vocations of Americans. He got the data from IPUMS. In the chart below you can see that as the number of farmers, farm laborors and domestic laborors decreased, the number of professionals, service and clerical workers increased. Without the increasing productivity in the farm sector, most Americans and Canadians would not have been able to pursue these other careers. In modern societies we tend to romanticize the lifestyle of our more agrarian past. 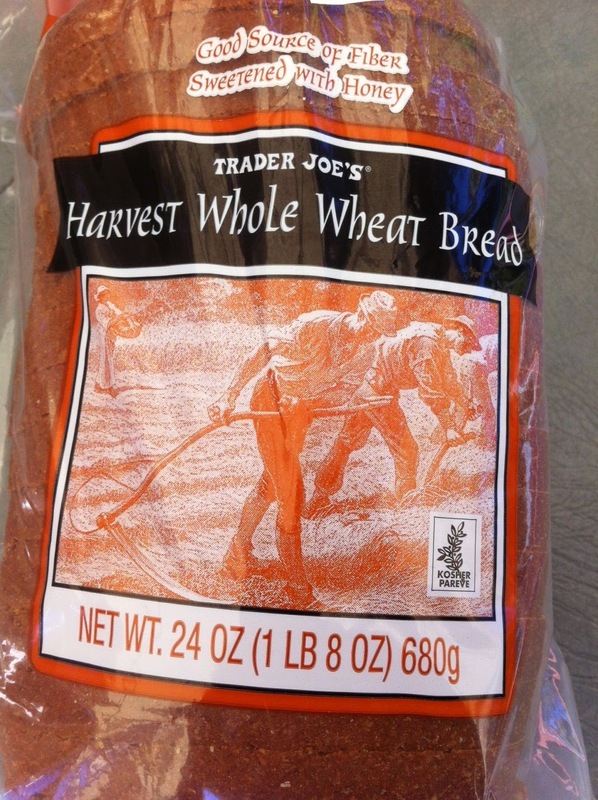 An example of that would be the image below of people hand harvesting wheat on the bag for some bread I recently bought at Trader Joes. I’m quite sure that is not how the wheat for that loaf was harvested. Chances are good that the flour for that loaf originated on a farm in a place like North Dakota or Alberta where high quality hard red spring wheat is grown by farmers who quite commonly tend one, two or even ten thousand acres of land. In a typical “food movement” narrative that would be disparagingly described as "big-" or industrial agriculture.” Some would assume that this was a product originating on a “corporate farm.” Those common conceptions are completely wrong and farmers find the terminology quite annoying. Because it takes so few people to farm, and because so few people have any interaction with farmers, the terms "big", "industrial' and "corporate" seem reasonable to describe a multi-thousand acre farm. I’ve had the opportunity to visit scores of such farms over the years as part of my consulting work. Whether the farmer I visited took care of several hundred or even several thousand acres of land, the “office” in which I met them for an interview was either at the kitchen table or sometimes a desk tucked in the back corner of the machine shed. These farmers reflect the objective reality that 96% of American and 97% of Canadian farms are still family owned and operated. If they are incorporated it is only for the purposes of estate planning. I’ve also always found farmers to be extremely pleasant people with the same basic values as the rest of society, particularly when it comes to stewardship of the environment. What they do for a living entails far more economic uncertainty than most of us could handle and a workload well beyond the norm. However, almost inexplicably, these farmers tend to have a high level of job satisfaction and remain in the business more based on life-style values than economic returns. It is a sort of cruel irony that the tremendous efficiency of the tiny, remaining farming population leads to the believability of false narrative like “big Ag.” Yes, we are a rich population far removed from the production of our food, but that is not something to blame on the farmers. They deserve our respect and appreciation – not the sort of dismissive criticism that is so common today. Most people won’t get to go out and meet farmers as I have been priviledged to do. You can, however, get to know them through some of their blogs as a way to overcome the typical false narratives that so many urbanites are digesting. I can tell you that the farming community is deeply troubled by the way that they are typically portrayed. Individually and through their various organizations farmers are trying to better tell their stories. Below are listed some blog links. If you still feel the need to blame someone for your remoteness from this critical human activity, direct that at Jethro Tull, not a farming family.